Our Railway track is 6½ miles long and runs from Bodmin Parkway through to Boscarne Junction via the line’s principal station at Bodmin General where all trains reverse. A journey of the full length of the track is 13 miles and will take around 2 hours by steam, or slightly less time on our Auto Train as the locomotive does not have to change ends. The line is steeply graded for most of its length, the ruling gradient being 1:37 to 1:44, and has many curves! The majority of our visitors purchase a ‘Freedom of the Line’ ticket which enables them to pay once and travel all day – you can see the whole line and travel where you like, and as much as you like! Passengers arriving by car will join at Bodmin General and by train, at Bodmin Parkway. Please note, there is no wheelchair access at Bodmin Parkway station. This station is operated by First Great Western, is situated on the main line between Plymouth and Penzance and is located in the picturesque Glynn Valley, about 20 metres above the River Fowey. BWR trains have exclusive use of Platform 3, adjacent to the platform used by Plymouth-bound trains. Connections can be made with services on the national network. The BWR has a carriage storage shed here and there is also an exchange siding which provides access onto the Up Main Line, controlled by Lostwithiel Signal Box. Visiting locomotives sometimes arrive this way. Freight trains also once used this connection on a regular basis, but this traffic has now ceased. Bodmin Parkway station (originally called Bodmin Road) was originally constructed by the Cornwall Railway in 1859, became part of the Great Western Railway in 1876, and remains a busy station on the national railway network. It became a junction from May 1887 when the branch line to Bodmin was opened. After arriving at Bodmin Parkway from Bodmin General, the locomotive will uncouple and move to the opposite end of the train for the return journey. The line climbs steeply immediately after Bodmin Parkway, and the Fireman will need to ensure the locomotive has a good fire and a full head of steam for the climb to the summit. As the train departs from Bodmin Parkway, the rolling stock storage facility – opened in 2007 and able to accommodate up to twelve carriages – can be glimpsed before the line curves sharply and crosses a viaduct spanning the River Fowey below. A little further on the line passes ‘Charlie’s Gate’, and the main A38 trunk road comes into view. Charlie’s Gate was named after the many times that the Royal Train was stabled here overnight carrying members of the Royal Family, including HRH Prince Charles, Duke of Cornwall. After passing under the A38 in what appears to be a tunnel, but is actually a bridge, the line continues to climb sharply and approaches Colesloggett Halt, built in 1992 to serve a Farm Park adjacent to the station (now closed). Trains to, and not from, Bodmin Parkway stop here. The Halt makes an ideal place to alight from the train for walks in the nearby Cardinham Woods. The Public Footpath to the Woods is 1 ½ miles long. It can be wet and muddy at times, runs through fields and has stiles at certain points and is not recommended for wheelchairs, pushchairs or those with reduced mobility. Continuing to climb, the line passes under both the A38 and A30 trunk roads before reaching the summit – and the highest point of the whole 6½-mile line – at Quarry Curve. Now on the outskirts of Bodmin, the branch skirts the edge of Walker Lines Industrial Estate and the Gilbert Monument on Bodmin Beacon, erected in 1857, can be glimpsed in the background, before descending towards the town. The Walker Lines Industrial Estate was originally part of Bodmin’s Army barracks. Built for US troops stationed in Bodmin in the 1940’s, and during the Cold War the site became home to the JSSL – the Joint Services School of Languages, also known as the Russian Language ‘School for Spies’. You can find out more about the fascinating history of the Walker Lines Estate at Bodmin Town Museum or Cornwall’s Regimental Museum. Bodmin General, the terminus of the original branch, is located about half a mile from the town centre and dates from 1887. The exterior of the station building is largely as it was when originally opened, and visitors will find many period featured in and around the station. The station was restored to reflect a typical station of the 1950s, is now the Head Office and principal station on the BWR. It has a single platform and traditional semaphore signals, operated from the signal box at the end of the platform, which now controls all train movements. The station at Bodmin General has a ticket office, admin offices, Old Booking Hall Café, a gift shop, Exhibition Coach and toilet facilities, together with a car park (free to visitors), a fully equipped workshop and locomotive running shed. Several locomotives and items of rolling stock can be viewed on display or receiving attention in the workshop. Upon arrival at Bodmin General, the locomotive – having pushed its train back along the platform a short distance – will uncouple and run round its train, taking water from the water tower en route. As this is going on, passengers will be boarding the carriages ready for the onward journey to Boscarne Junction. The branch from Bodmin General to Boscarne Junction, nearly three-miles long, was opened by the Great Western Railway in September 1888 to link the Bodmin branch with the original Bodmin & Wadebridge Railway (opened in 1834). It is also steeply graded throughout its entire length descending from Bodmin General to Boscarne. Leaving Bodmin General, the line to Boscarne turns right immediately after passing the locomotive running shed – where you can glimpse locomotives awaiting their next turn of duty – and descends on a ruling gradient of 1:40, the first 250 yards of which are around a very tight curve with a ‘check rail’ to give extra guidance to the train’s wheels. 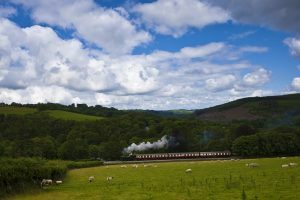 Once around the curve, excellent views can be had of the surrounding countryside, with views across to Kirland and the historic Halgavor Moor on one side of the train and of Bodmin Beacon on the other side. The Bodmin Beacon monument is 144 feet tall, and was built in 1856 in memory of Sir Walter Raleigh Gilbert, a local dignitary. It stands on the site of a dog-friendly nature reserve, and is within walking distance of Bodmin General Station. The line continues to descend as it leaves Bodmin behind and heads out into open countryside. Shortly before arriving at Boscarne Junction the line passes over the River Camel, which flows out to sea through Wadebridge and Padstow. Boscarne was the junction of the original Bodmin & Wadebridge Railway (later London & South Western Railway, and then the Southern Railway) and the Great Western Railway. At one time the location was quite a busy place, with trains heading to/from Wadebridge, Padstow, Wenfordbridge, Bodmin North, Bodmin General and Bodmin Road, though it is somewhat quieter these days! The station here – built in the style of a Southern Railway halt and consisting of a single platform complete with waiting room – was constructed by the BWR and opened in 1996. It is situated directly adjacent to The Camel Trail footpath and cycleway, and thus offers an opportunity to take a walk, picnic or bike ride and catch a later train back. There is a pub, tea room and vineyard all within a 30-minute walk of the station. After arriving you can watch the locomotive change ends before the train leaves again to head back up the gradient to Bodmin General.